Mr. Townsend founded Perpetual Power to explore development opportunities in the renewable energy space. Previously working in commercial real estate investment banking, Paul formed P2 to capitalize on the growing renewable market. With the early success of P2, Paul was able grow the business and focus his energies on sales and strategic planning. As P2 continues to grow Paul still directly manages the sales team and pushes the organization to explore new partnerships and strategic imperatives.Combined with his years of solar expertise Paul also brings a background in financial management, sales process analysis, marketing and business development. Mr. Townsend holds a BS from the University of Oregon. Mr. Huber leads the development of all P2 product lines and mounting system architecture. Mike was a founder of SunLink, and the designer of the SunLink mounting system, one of the first successful commercial flat-roof PV mounting systems widely available. Mike continues to improve PV module mounting and PV generator system design for P2 through coordination of design and analytical efforts and boundary layer wind tunnel testing. Mr. Huber's engineering career includes 15 years plus in aerospace/defense. He has particular expertise in mechanical design optimization, design for manufacturability and design for robust assembly. He holds 5 patents with others pending and certifications in PV system design and installation, CAM system programming, CNC machine tool operation and automation. Mike holds a BS in Mechanical Engineering from the University of California, Davis and presented a technical paper "Application of Wind Tunnel Testing and Finite element Analysis to Development of a Photovoltaic Module Mounting System" to ISES Solar Congress in August 2005. 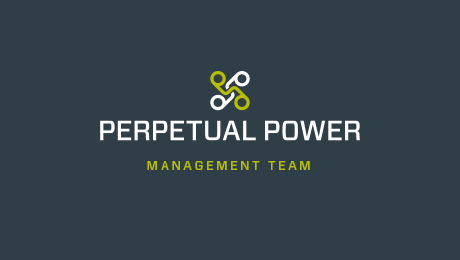 Mr. Heath first joined Perpetual Power in 2010 to help restructure the company and improve operational and financial performance. Campbell came to P2 with a background in banking, corporate finance and strategy development. In his career Campbell has consulted for a wide range of startup companies and small businesses. Campbell holds a BA from Union College and an MBA from Columbia University.